You’re at the store. It’s been a long day, but it’s almost over. You just need to track down some food that wasn’t grown in a chemical bath or harvested by exploited workers. 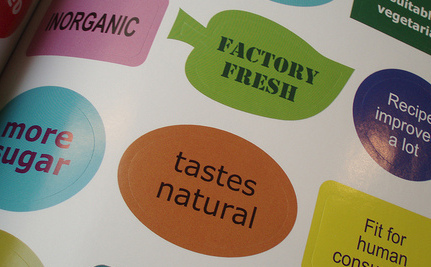 Thank goodness for labels: fair trade, organic, natural, responsible. These things mean something, right? Well … sometimes. Let’s start with the good news. Over the last few decades, consumers have become aware of corrupt practices in the food supply system and, in their effort to avoid supporting these practices, have fundamentally altered the marketplace. As of 2010, organic food was a $26.7 billion industry. In 2011, fair trade accounted for a lower but still significant share at $1.2 billion. Ethical marketing campaigns have proven so effective that major corporations want in on some of the profits. Such demand could have created a positive transformation in the food industry. Imagine a world where even the largest producers are committed to healthful food, sustainable practices, and fair wages. However, rather than altering business models to create such a product, corporations are using the language of the natural food movement to mislead people into buying exactly what they’re trying to avoid. The recent controversy over Kashi cereals put a spotlight on the issue (thanks, EcoSalon). As a look through comments on Kashi’s website reveals, many customers felt a sense of betrayal upon learning that the Kellogg-owned company uses its natural-food image to sell products that contain genetically modified organisms (GMOs) grown with pesticides. Buying safe, ethically-produced food is getting tricky, and cereal is just the beginning. Officially, the “natural” label doesn’t mean much, though Californians are trying to change that. They’d like the term to designate foods free of GMOs. The U.S. Food and Drug Administration maintains that such labeling is unnecessary because GMOs are essentially like any other food. This stance is disingenuous, at best. Recent research indicates that gluten intolerance stems from wide use of genetically modified (and untested) wheat crops. Moreover, many GM crops are adapted for higher tolerance to pesticides. The issue, then, might be less with the crops themselves and more with what is being put on them. If you’re not sure which labels will steer you clear of pesticides, this guide to labels from Mother Jones offers a good starting point. But remember, the game is always changing. Next, we will have to keep an eye on labels reading “responsible” and—possibly—“sustainable.” Writing for Dollars & Sense, John Latham reports that the World Wildlife Fund (WWF) and other conservation groups have entered into a labeling compromise with the likes of Monsanto, Cargill, and BP. The deal is that if these producers follow a set of guidelines, the conservation groups will back labels reading “responsible.” However, the established guidelines offer too little improvement over current practices to have the intended effect of sustainability. According to Latham, the standards “are far lower than organic or fair-trade standards; for example, they don’t require crop rotation, or prohibit pesticides.” And although the WWF’s goal is to stop Big Ag’s destruction of the rainforest, the guidelines “would still allow 25 percent of the Brazilian soybean harvest to come from newly deforested land.” Latham quotes Claire Robinson of Earth Open Source, saying, “The [Roundtable on Responsible Soy] standard will not protect the forests and other sensitive ecosystems. Additionally, it greenwashes soy that’s genetically modified to survive being sprayed with quantities of herbicide that endanger human health and the environment.” Never mind responsible and sustainable — is it safe? It’s a good argument, but what about promoting companies that are truly sustainable and calling to boycott Monsanto, Cargill, and the others until they change their practices? Such a strategy was not even attempted before resorting to a compromise that, in the end, deceives consumers. Perhaps the World Wildlife Fund is right and the guidelines will lead to sustainability over time. Meanwhile, it’s good to know that “responsible” foods are probably laden with chemicals and contributing to deforestation. If there’s anything to learn from the label debate, it’s that there are no easy answers. We have to do the research and decide for ourselves. This post originally appeared on Utne Reader. or are they being creative and people are bot interpreting correctly?? ?